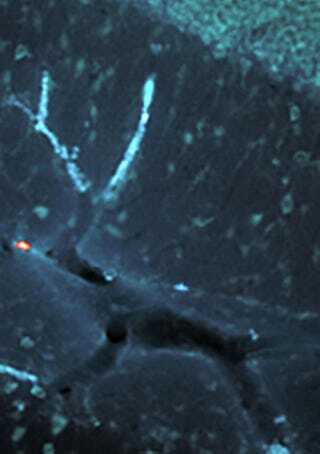 A close-up image of a blood vessel in the brain shows a picture that looks amazingly like Rudolph the Red-Nosed Reindeer. Seriously, there's the antlers, the tail, and even the famous glowing red nose. The scientists who stumbled upon the picture were studying the inner workings of neurons in the hippocampal region of the brain. The "red nose" in the picture happened by chance when the scientists were labeling the image. They cheated a little bit by overexposing the image to make the label show up as red (the antlers also popped more after overexposure), but it's such a fun find (that has no scientific purpose).